The Crop Protection Network (CPN) is a multi-state and international collaboration of university and provincial Extension specialists, and public and private professionals that provide unbiased, research-based information to farmers and agricultural personnel. This effort is currently supported by the North Central Soybean Research Program (NCSRP), United Soybean Board (USB), and Grain Farmers of Ontario along with OMAFRA. US partner institutions include Purdue University, Iowa State University, University of Wisconsin-Madison and Michigan State University as well as specialists/researchers from other Land Grant Universities. All Land Grant Universities involved are also supported by the United States Department of Agriculture. Continue to work with and organize a core group of Extension personnel including Ontario to annually identify and develop Extension material for new or emerging (endemic) diseases for Ontario and the Midwest US. Provide information on emerging soybean diseases at multiple levels of Extension interface (print, web, video, smartphone, magazine, etc.) to reach diverse groups of stakeholders. Create a platform to host and brand Extension material developed in conjunction with the North Central Soybean Research Program and Grain Farmers of Ontario to facilitate updates and allow users to identify trusted sources of material through this branding partnership. Provide current research summaries on emerging diseases to direct and coordinate future research priorities thereby minimizing duplication, maximizing resources and increasing response time. The development and dissemination of the most up-to-date information pertaining endemic and new disease risks each year to all producers in the north central and Ontario region provided producers and industry with timely information to make effective management decisions. The development and dissemination of Extension material developed in conjunction with the North Central Soybean Research Program and Grain Farmers of Ontario provides a consistent message and maximizes efficient use of limited resources. The ultimate goal of this project is that industry personnel and soybean farmers will have an improved awareness of emerging diseases, and this information will prevent soybean/corn yield losses by identifying and managing present and future disease issues. Canada ranks as one of the major soybean producing countries with a global reputation for quality and high yields. Unfortunately, yields in many of the major soybean countries including Canada (especially Ontario) are reduced each year due to diseases resulting in unnecessary losses to the producer and agriculture sector as a whole. The most recent disease losses for Canada (2006) are 363,000 metric tonnes (13,338,072 bushels) at a potential conservative cost of over $154,855,015 (Cash Price – $11.61 Dec 4, 2015). Changes in crop production and environment impact the disease severity and prevalence each year. There are diseases that are an annual threat, such as sudden death syndrome (SDS) and soybean cyst nematode (SCN) but many other diseases are sporadic, new, or emerging in the North Central Region and Ontario. These diseases are concerning to farmers due to the lack of management information available when outbreaks occur. In a traditional system, research is conducted and Extension materials are developed and disseminated at the end of the project. This creates a “gap” in industry and farmer awareness for emerging diseases, and prevents stakeholders from obtaining the most current information about emerging issues until research projects can be completed. Unfortunately this information may never be extended to the grower or not in a form which is useful. This project builds on a previous Grain Farmers of Ontario and North Central Soybean Research Program (NCSRP) project with the same title aimed specifically at improving disease awareness amongst producers and stakeholders thereby reducing not only risk but most importantly economic losses. This project will provide multiple forms of information about emerging diseases to the agriculture industry and soybean farmers in a timely manner. The project uses print information and electronic information delivery that can be accessed with traditional and newer (smartphone, tablet) technology. These tools can be easily updated and incorporate the latest research findings so that management recommendations are current and relevant to producers. The group will also provide updates on ongoing research in the area of each disease, which can aid in directing and assessing future research needs. 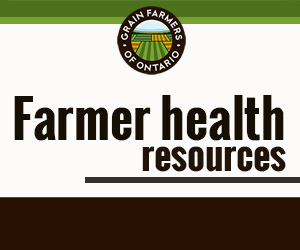 The ultimate outcome is that industry personnel and soybean farmers will have an improved awareness of emerging diseases, and understand what Grain Farmers of Ontario/OMAFRA resources are available. This information will prevent soybean yield losses by identifying and managing present and future disease issues.